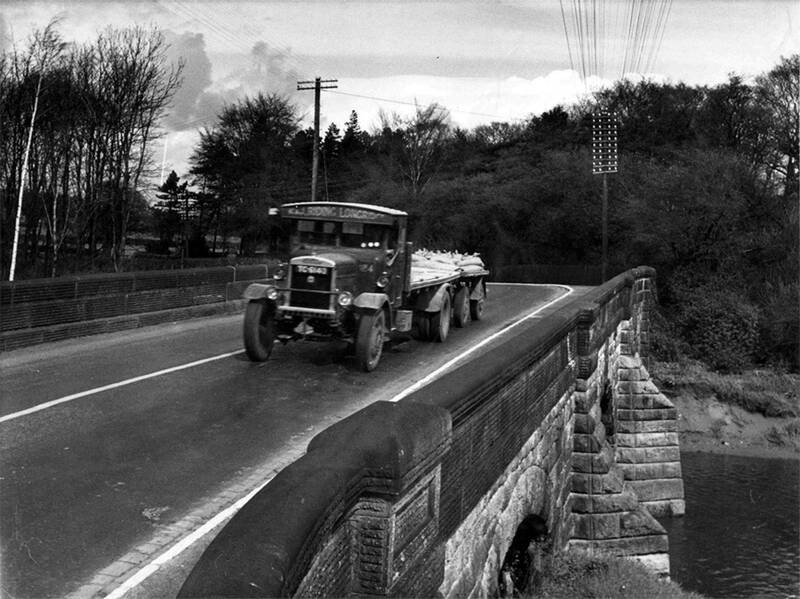 The haulage company of W & J Riding Ltd originated in Longridge near Preston Lancashire in 1922 when local farmers Mr William Riding and his eldest son Jim Riding started to supplement their income by using horse and carts to move coal and cattle food from the local railway station. Deciding that the future was in using motor vehicles they built a large garage on part of their farmland and named it Daniel Platt Garage, after the adjacent family owned Daniel Platt Farm. Jim bought a second hand Karrier six tonner which allowed them to do much longer journeys but, unfortunately, the lorry was very unreliable and frequently broke down. However they soldiered on until 1929 when the Karrier was eventually traded in for a brand new Leyland QH4. The Leyland QH4 four wheeler was a great success and from this time on Leyland lorries would be used almost exclusively by W & J Riding until 1963. 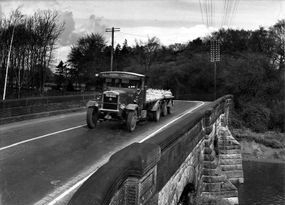 On the 1st of July 1948 the company was nationalised and became Unit C132, part of British Road Services Burnley group, with Jim Riding staying on as depot manager. Three years later, in March 1951, Jim Riding bought a company called Queensgate Motors from his brother-in-law Walter Carefoot. 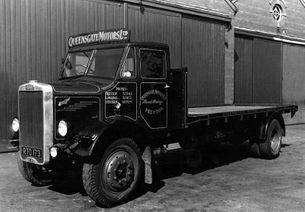 Queensgate Motors consisted of two Bedford tippers and in 1954 when de-nationalisation began a number of ex BRS vehicles with their valuable 'S' licences were also purchased and thus added to the Queensgate Motors business. From here on in the company grew and grew and acquired substantial amounts of work especially from the ICI plants at both Teesside and locally in Lancashire. On November the 5th 1954 Jim Riding bought back his original depot along with the vehicles from BRS Ltd and retained the original W & J Riding name, even though his father William took no part in the purchase. Jim Riding's eldest son James had already joined him two years earlier in 1952 after leaving university. In 1956 after an engineering apprenticeship at Leyland Motors his other son Tom also joined the company. From this time on the rest is history with W & J Riding evolving into one of the most famous haulage firms in the country, at its peak operating well over 100 vehicles throughout the UK. In 1963 the haulage company William Metcalfe of Darlington was aquired with seven 'A' licences. A number of years later, in 1968, a wholly owned subsidiary company called W & J Riding Bulk Haulage Ltd was created and the company moved into the bulk powder business which became a major part of the haulage work that Riding's undertook. Come 1970 and the successful family owned company of W & J Riding was sold to the Transport Development Group Ltd (TDG) with Tom Riding becoming managing director. 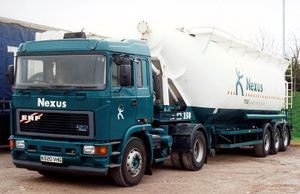 In 1975 Tom Riding decided that all their vehicles would be individually named, many after steam locomotives, which was a nice touch, and in later years their trade mark logo 'The Best In The Long Run' was applied to the front grill of many of the companies vehicles in the 100+ strong fleet. Unusually for the Transport Development Group they agreed to retain the familiar W & J Riding blue and grey livery until the retirement of Tom Riding some twenty years later in October 1995 after which time, and literally within a period of months, all the tractor units in the fleet were re-branded into the bland Transport Development Group Ltd scarab green or blue livery. TDG Ltd continued to operate from the same depot at Longridge, where W & J Riding had started all those years ago, until they finally moved out in December 2010. Three months later, in March 2011, TDG were themselves bought out by Norbert Dentressangle whom in turn were bought out for £2.3bn by US logistics company XPO Logistics in June 2015. A special thank you to Tom Riding, former managing director of W & J Riding for 25 years, without who's invaluable help this website would not have been possible. Tom has been kind enough to supply a vast amount of detailed historical information along with many of the superb rare photographs featured on this site which now contains over 1400 images, all of which are accessible via the main menu down the left hand side of this page. You can now click on any image on the website and a full size version of the photograph will appear. All blue text is clickable and takes you to the relevant page or website, for example, clicking on ERF will take you to the ERF section of the site. We hope you enjoy your visit to this site. We also hope that you have plenty of time on your hands as it could take you quite a few hours to view all the pages in fine detail which now contain over 1500 pictures. For your enjoyment all annoying adverts and popups have been removed from the site. If you would like to make a small donation to the sites running costs it would be very much appreciated. Please click on the donation button in the right hand column and thank you for your valued support. Clicking on any picture below will take you to the relevant gallery.